Stanley Kubrick made some really weird movies. If you want a little peak at his mental formation, the 10,000 photos he took as a teenager will probably only confuse you more—in a good way. 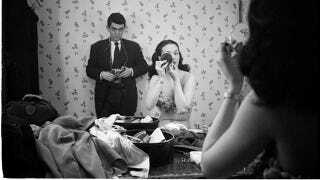 If you're not curious about what went on in Stanley Kubrick's brain, you don't have a heartbeat. At some point about halfway through 2001: A Space Odyssey here's what everyone should be thinking: "WTF Stanley Kubrick? There's no more dialogue in this movie? I hate you." No one thinks that because the film is a complete transfixing masterpiece. Kubrick has about 10 movies that good, and each is completely different from the rest. Click "enlarge" in the bottom right corner of the images in the gallery to view them larger. It's worth it!